When we encounter a season of gloom, light becomes powerful. Now that I rise well before dawn, the first thing I do in the dark house is light an oil lantern on the dining room table. Throughout the day I continue to light candles and lamps. Now, I have electricity–I can turn on those glaring lights and I do soon enough. But I like live flame. Here are three lamps I keep on the table. Each serves a purpose. 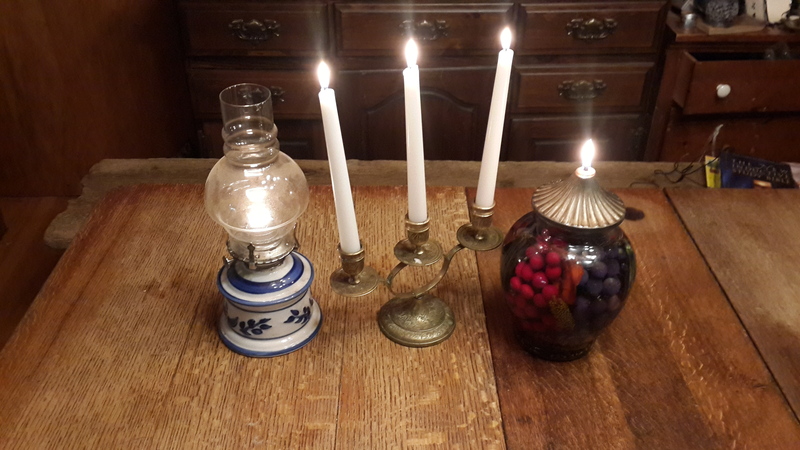 The first one, the oil lamp, puts out a fair amount of light, so I light that first. I feed the milling cats, light the woodstoves, water the cat fountain, and dress by this light. When the boys join me for Latin and Math later, it continues to burn. In this context it represents enlightenment. Every time we study together we light it. The flame lives in constant motion, like our thoughts as we parse our Latin sentences. It reminds me to take education seriously, theirs and mine, because in some sense our studies light a fire that will continue to burn throughout our days. The middle lights, the candelabra, signify for us the beginning of the Lord’s Day. We used to do this every week, sharing a fresh loaf of braided bread and putting out the nicest dishes. Lately I have revived at least the lights; going gluten free has taken challah off the table. (Boo hoo.) We have created a little ceremony to light them. I fight depression in the winter. Ho hum. Nothing startling in that; I have yet to meet someone who stays perky. I think a lot about darkness, and of the strange qualities of light. Darkness cannot wrap its leathery wings around light and quench it; darkness cannot comprehend light. Like love over hatred, kindness over cruelty, light conquers darkness. As I type this, the librarians are starting to turn out the lights and so gently chase out the lingering patrons. May you always have the light for which your soul yearns. This entry was posted in Healthy Living, writing101 and tagged light, writing101. Bookmark the permalink. Ha! I was going to link to your website but didn’t see that this would help interested readers find it. Do you deal with online orders? I do love that lamp.